​Diana Lara is a very interesting exercise teacher. Some of her exercises are deceptively simple. You go through a set of these simple exercises thinking there’s not much to them and then you realize your spine has had a real workout. I’ve had occasional pain in my lower back for years. A few months working with Diana has eliminated that occasional pain. Another interesting set of exercises mimics the movements of a baby in the womb. Again these movements are deceptively simple but you’re moving and stretching major muscle systems and giving your spine a workout. Very clever. There’s a very subtle dynamic to her movements. Diana teaches you flexibility, agility and balance in simple straightforward ways that soon become very rewarding. I have been exercising regularly in Diana’s classes for a few months now. I am really impressed that she designs the movements focusing on the most important area in our body – the lower spine area which is referred to as the Dan-tian in Chinese Tai-chi and Qigong and Kundalini in Yoga. I feel the new spinal flexibility I have gained is going to make my old age mobility much easier. I now look forward to her classes because I can feel the difference these workouts have made. Since I became involved with the Always Active Program, I have looked forward to the exercise classes , during the past 5-6 yrs. I have especially enjoyed the classes with Diana Lara, the past year and a half, as she varies the exercises every week. She is very kind and gentle to each of us and points out where we can improve. It is fun and the music is energizing. I hope to participate for many more years and I always feel good when I leave. The pace of the exercises is just right and she stresses that we can modify the exercise. The Body-Mind Centering approach to dance taught by Diana Lara, gave me the opportunity to find new motor impulses and movement experiences. I translated my focus from the musculoskeletal system—which prevailed during many years in my training as a dancer—to a kinesthetic universe of fluids and tissues. This new approach fostered a wide range of emotions and mental states. Through movement exploration, hands-on exercises, and empathetic feedback, a new experience of movement arrived to me. My corporeal movement was no longer simply a vehicle of a choreographer’s idea. It transformed into a vital source of creative processes. Dulce Trejo, MFA in performance arts, Mexico City. Diana is such a gentle, patient, and very knowledgeable teacher and dancer. 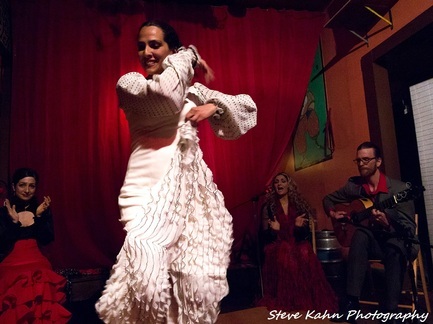 I'm a flamenco dancer and the first time I saw her dancing made me want to dance with and like her. Fortunately, now I have the time and opportunity to take private lessons with her. She is helping me to understand how to use my body in ways I have never done before or that I have forgotten. Diana is making me explore all the layers of tissues that I can use to move around, and I'm learning a lot about Anatomy and Physiology. After every class with Diana, I feel so much more grounded, I feel like I did great things with my body and at the same time caressed it inside-out. Diana is not only an amazing dancer with a fun and unusual creativity, but also a kind and challenging teacher. Bonner Odell. NOHspace, Abril 2010. Under Diana’s masterful guidance, I discovered whole new worlds of movement possibilities specific to my own body. Her playful yet subtle prompts kept me absolutely in the moment, even as they guided me to progressive levels of expressivity and risk-taking. Diana is an extremely intuitive teacher. The beauty and irony of her mastery is that she puts the power in the dancer’s hands. 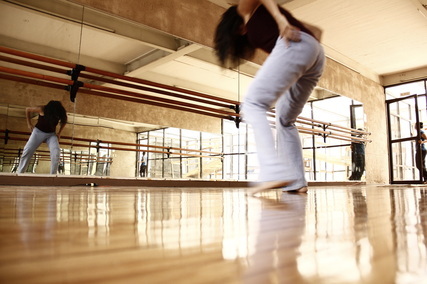 I am a more curious, confident dancer for having taken her classes.